We affirm the order On Motion for Default and Motion to Dissolve Writ of Garnishment. The trial court properly denied T.G.O.B., LLC’s motion to dissolve writ of garnishment as it was untimely. § 77.055, Fla. Stat. (2009). As the court properly observed in that order, “the plaintiff, Michael J. Murphy, stands in no stronger position than that of the defendant, debtor, Carl E. Lindback, III. Thus, the plaintiff can only recover the amount of funds that the defendant would have been entitled to, but for the garnishment.” Therefore, while T.G.O.B. is a party for purposes of determining the garnishment amount (if any) at a final hearing, only Carl E. Lindback’s interest in the funds can be subject to garnishment. The law firm’s role in this action is strictly that of a garnishee, or holder of the disputed funds for the benefit of the law firm’s client. There is no merit to the argument that the law firm’s role when served with the writ was that of an escrow agent. Whether Florida law permits a court to order a judgment debtor to surrender all right, title, and interest in the debtor's single-member limited liability company to satisfy an outstanding judgment. Section 608.433(4) does not displace the creditor's remedy available under section 56.061 with respect to a debtor‘s ownership interest in a single-member LLC. Answering the rephrased certified question in the affirmative, we hold that a court may order a judgment debtor to surrender all right, title, and interest in the debtor‘s single-member LLC to satisfy an outstanding judgment. Notably, there was a forceful dissent refusing to "join my colleagues in the judicial rewriting of Florida's LLC Act. Make no mistake, the majority today steps across the line of statutory interpretation and reaches far into the realm of rewriting this legislative act." The briefs filed in the case can be viewed at the following links: Initial Brief (Olmstead), Answer Brief (FTC), Reply Brief (Olmstead), Amicus Brief (Zimmerman, Kiser & Sutcliffe, P.A. ), Amicus Brief (Prof. Daniel S. Kleinberger). The court held oral argument on January 8, 2009 and the oral argument can be watched HERE. **Update: A motion for rehearing was filed on July 8, 2010, which can be viewed HERE. On July 23, 2010, the FTC filed its response to the rehearing motion which can be viewed HERE. The Court denied the motion for rehearing on August 31, 2010, and the order can be viewed HERE. **Update #2: After the certified question was answered, the case was returned to the Eleventh Circuit and on September 29, 2010, the Eleventh Circuit issued an opinion that can be viewed HERE. See 621 F.3d 1327 (11th Cir. 2010). Professor Carter Bishop had a post about the decision HERE. You can also view Professor Bishop's "Fifty State Series: LLC Charging Order Statutes" HERE. The University of Pennsylvania Law School is hosting Professor Bishop's Memorandum Charging Order, HERE. Professor Bishop's article "Desiderata: The Single Member Limited Liability Company Charging Order Statutory Lacuna" can be downloaded HERE. Professor Gary Rosin at the "Unincorporated Business Entities Law" Blog had two posts about this decision, HERE and HERE. Professor Larry Ribstein had a discussion HERE at the "Truth on the Market" Blog. Professor Stephen Bainbridge had two posts at ProfessorBainbridge.com, HERE and HERE. The "Business Law Prof Blog" has a post HERE. The ABA webstore even has a CD CLE titled "Are Single-Member LLCs a Ticking Time Bomb for Asset Protection?" which can be viewed HERE. The KYEstates.com blog has a post titled "Your Single-Member LLC: Not A Mighty Fortress," which can be viewed HERE. Professor Carter and Professor Kleinberger co-authored an article titled "The Single-Member Limited Liability Company as Disregarded Entity" which can be viewed HERE. BNA Tax & Accounting has an article titled "Olmstead and Piercing the Veil" which can be found HERE. Appellant Rhonda Hendrix alleges that her son, G.P., sustained traumatic brain injuries when a child restraint system manufactured by Defendant-Appellee Evenflo Company, Inc., (“Evenflo”), malfunctioned during a minor traffic accident. Hendrix further alleges that those brain injuries caused G.P. to develop autism spectrum disorder (“ASD”) and a spinal cord defect known as syringomyelia. Nearly eighteen months after the accident, G.P. began to exhibit developmental problems....Approximately three years after the accident, Dr. Suhrbier diagnosed G.P. with an asymptomatic spinal cord cyst....Dr. Suhrbier diagnosed G.P. with ASD in April 2007, when G.P. was five years old. Hendrix’s experts rely primarily on the differential etiology method to link G.P.’s traumatic brain injury to his ASD diagnosis. Differential etiology is a medical process of elimination whereby the possible causes of a condition are considered and ruled out one-by-one, leaving only one cause remaining....A reliable differential etiology analysis is performed in two steps. First, the expert must compile a “comprehensive list of hypotheses that might explain the set of salient clinical findings under consideration. . . . The issue at this point in the process is which of the competing causes are generally capable of causing the patient’s symptoms.”....Second, the expert must eliminate all causes but one. Hendrix does not contend that the medical community generally recognizes traumatic brain injury as a cause of autism. Therefore, the district court was correct to apply the Daubert analysis to the question of whether traumatic brain injury can, in general, cause autism. We emphasize that we express no opinion regarding whether traumatic brain injury sustained in the perinatal or neonatal period can ever cause or contribute to later development of an autism spectrum disorder. Rather, as we have previously stated: “The courtroom is not the place for scientific guesswork, even of the inspired sort. Law lags science; it does not lead it.” Rider, 295 F.3d at 1202 (quoting Rosen, 78 F.3d at 319). We emphasize also that our conclusion, and that of the district court, is based only on the evidence presented in this case. Given the current state of scientific knowledge regarding the causes of autism spectrum disorders (as it has been presented to us by the parties), we are unable to say that the district court abused its discretion in excluding this expert testimony. Because without this testimony there is no genuine dispute of material fact regarding causation of G.P.’s ASD, the district court’s grant of summary judgment on Hendrix’s sole remaining claim was appropriate. His widow, Maria Perez, as personal representative of the Decedent’s estate (the “respondent”), filed a lawsuit asserting a count of negligence against the Hospital in connection with her husband’s death. Respondent did not comply with the presuit requirements of chapter 766, Florida Statutes (2008), which include presuit notice as set forth in section 766.106(2)(a), prior to filing the lawsuit. Upon motion by the Hospital, the complaint was dismissed for the respondent’s failure to comply with chapter 766. The respondent then filed an amended complaint, removing the references to the Decedent being a patient at the Hospital and recharacterizing the Decedent as a “business invitee in [the Hospital].” The Hospital filed a motion to dismiss the amended complaint on the same grounds as its previous motion, but it was denied. The court stated that the respondent "disingenuously attempts to avoid the requirements of Chapter 766 by characterizing the Decedent as a mere “business invitee” and arguing that the claim is in fact not a medical negligence or medical malpractice claim. The court then rejected the respondent's "argument as it flies in the face of logic" and quashed the order under review because the action should have been dismissed. It is clear that the plaintiffs relied on Rule 1.540(b)(1) for their motion for relief from judgment. Subdivision (b)(1) allows relief from judgment on account of “mistake, inadvertence, surprise, or excusable neglect[. ]” A motion under Rule 1.540(b)(1) must be filed “not more than 1 year after the judgment, decree, order, or proceeding was entered or taken.” As the motion was filed more than one year after the judgment was entered, the trial court was without jurisdiction to amend the judgment. For that procedural reason, we reverse the amended judgment. The original judgment, of course, remains intact. The Answer Brief can be viewed HERE. The Appendix to the Answer Brief can be viewed HERE. If anyone has a copy of the Initial Brief and/or Reply Brief please send them to me. A complaint was filed against Huguette Chery to foreclose on a homeowner’s association lien that had attached to certain real property owned by Chery. On September 11, 2008, in the presence of Chery, the trial court entered a default final judgment against her for $3,639.98 plus interest and costs. A public sale of the property was set for January 13, 2009, in the event that Chery did not exercise her equitable right of redemption to cancel the sale by paying the amount owed. Chery did not remit the amount owed and her property proceeded to public sale with Aegis Properties of South Florida, LLC (“Aegis”) being the successful third party bidder in the amount of $4,600.00. Foreclosure sales are reversible if there is a grossly inadequate sales price or irregularities in the sale process. Arlt v. Buchanan, 190 So. 2d 575, 577 (Fla. 1966); see also Action Realty and Invs., Inc. v. Grandison, 930 So. 2d 674, 677 (Fla. 4th DCA 2006); Blue Star Invs., Inc. v. Johnson, 801 So. 2d 218, 219 (Fla. 4th DCA 2001) (“[T]o vacate a foreclosure sale, the trial court must find ‘(1) that the foreclosure sale bid was grossly or startlingly inadequate; and (2) that the inadequacy of the bid resulted from some mistake, fraud or other irregularity in the sale.’” (citations omitted)). Neither of these grounds applies in the instant case. We therefore reverse the order granting Chery’s emergency motion to set aside foreclosure sale and remand with directions to reinstate the final judgment of foreclosure and certificate of sale and thereafter issue a certificate of title in favor of the bona fide purchaser. We recognize the harsh result produced by this opinion but the law simply does not authorize the setting aside of the final judgment and certificate of sale under the facts of this case. DOES FLORIDA RECOGNIZE A COMMON LAW THEORY UNDER WHICH COMMERCIAL FISHERMEN CAN RECOVER FOR ECONOMIC LOSSES PROXIMATELY CAUSED BY THE NEGLIGENT RELEASE OF POLLUTANTS DESPITE THE FACT THAT THE FISHERMEN DO NOT OWN ANY PROPERTY DAMAGED BY THE POLLUTION? DOES THE PRIVATE CAUSE OF ACTION RECOGNIZED IN SECTION 376.313, FLORIDA STATUTES (2004), PERMIT COMMERCIAL FISHERMEN TO RECOVER DAMAGES FOR THEIR LOSS OF INCOME DESPITE THE FACT THAT THE FISHERMEN DO NOT OWN ANY PROPERTY DAMAGED BY THE POLLUTION? In sum, the Legislature has enacted a far-reaching statutory scheme aimed at remedying, preventing, and removing the discharge of pollutants from Florida‟s waters and lands. To effectuate these purposes, the Legislature has provided for private causes of action to any person who can demonstrate damages as defined under the statute. There is nothing in these statutory provisions that would prevent commercial fishermen from bringing an action pursuant to chapter 376. The Second District held that the fishermen's common law negligence and strict liability claims were barred by the economic loss rule and general tort law principles because the fishermen did not own any property damaged by the pollution...The district court found that Mosaic did not owe the fishermen an independent duty of care to protect their purely economic interests...Relying on a negligence principle that the law generally protects interests in the safety of person and property, the district court concluded that the fishermen failed to state a cause of action for strict liability or negligence because they had sustained no bodily injury or property damage. The Second District, in finding that the economic loss rule applied to the facts of this case, attempted to explain this Court's opinion in Indemnity Ins. Co. v. American Aviation, Inc., 891 So. 2d 532 (Fla. 2004). In American Aviation we undertook a comprehensive look at the economic loss rule including its origin and scope. We clearly stated that the economic loss rule in Florida is applicable in only two situations: (1) where the parties are in contractual privity and one party seeks to recover damages in tort for matters arising out of the contract, or (2) where the defendant is a manufacturer or distributor of a defective product which damages itself but does not cause personal injury or damage to any other property. Clearly neither the contractual nor products liability economic loss rule is applicable to this situation. The parties to this action are not in contractual privity. Moreover, the defendant in this case is not a manufacturer or distributor of a defective product that has caused damage to itself. Rather we have plaintiffs who have brought traditional negligence and strict liability claims against a defendant who has polluted Tampa Bay and allegedly caused them injury. Thus, the economic loss rule does not prevent the plaintiffs from bringing this cause. Finally, the court addressed potential common law causes of action. In addition to finding that the fishermen's claims were barred by the economic loss rule, the Second District also found their claims barred because “Mosaic did not owe an independent duty of care to protect the fishermen's purely economic interests—that is, their expectations of profits from fishing for healthy fish.” Curd, 993 So. 2d at 1083. We hold that Mosaic did owe a duty of care to the fishermen, a duty that was not shared by the public as a whole.....We conclude, as did many of the courts in the cases discussed above, that the defendant owed a duty of care to the commercial fishermen, and that the commercial fishermen have a cause of action sounding in negligence....In the present case, the duty owed by Mosaic arose out of the nature of Mosaic‟s business and the special interest of the commercial fisherman in the use of the public waters. First, Mosaic‟s activities created an appreciable zone of risk within which Mosaic was obligated to protect those who were exposed to harm....Mosaic‟s business involved the storage of pollutants and hazardous contaminants. It was forseeable that, were these materials released into the public waters, they would cause damage to marine and plant life as well as to human activity....Here, the discharge of the pollutants constituted a tortious invasion that interfered with the special interest of the commercial fishermen to use those public waters to earn their livelihood. We find this breach of duty has given rise to a cause of action sounding in negligence. We note, however, that in order to be entitled to compensation for any loss of profits, the commercial fishermen must prove all of the elements of their causes of action, including damages. Justice Polston concurred in part and dissented in part. Justice Canady was recused. DOES A NONRESIDENT COMMIT A TORTIOUS ACT WITHIN FLORIDA FOR PURPOSES OF SECTION 48.193(1)(b) WHEN HE OR SHE MAKES ALLEGEDLY DEFAMATORY STATEMENTS ABOUT A COMPANY WITH ITS PRINCIPAL PLACE OF BUSINESS IN FLORIDA BY POSTING THOSE STATEMENTS ON A WEBSITE, WHERE THE WEBSITE POSTS CONTAINING THE STATEMENTS ARE ACCESSIBLE AND ACCESSED IN FLORIDA? In this case, the Eleventh Circuit recognized that, under Wendt, Marshall would be subject to jurisdiction under section 48.193(1)(b) if her allegedly defamatory posts on her website constituted electronic communications "into Florida." Internet Solutions Corp., 557 F.3d at 1296. The determination of whether certain acts constitute communications into Florida is straightforward when the case concerns telephonic communications, written communications, or electronic communications in the form of e-mails or facsimiles, because those communications are directed to reach a specific recipient in a specific forum; in other words, it is clear that the nonresident defendant‘s communications were made into Florida. Courts have also held that electronic communications over the Internet in the form of e-mails and chat room conversations into Florida give rise to personal jurisdiction under section 48.193(1)(b) on the basis of Wendt. The question of whether a posting on a website, which is located on the World Wide Web, constitutes an electronic communication into Florida is a more difficult one than telephone calls, e-mails, chat rooms, and facsimiles because the posting is typically accessible from any state and is not directed by the alleged tortfeasor into a particular forum in the same way as a phone call, letter, e-mail, chat room, or facsimile. At the outset, it is important to note that the Internet and the World Wide Web are not synonymous. The Internet is the world‘s largest computer network...There are multiple ways to transmit and receive information across the Internet, including e-mails, chat rooms, and the World Wide Web..."[T]he Web constitutes the body of information available, and the Internet refers only to the means by which one can access that information."... "Individuals commonly access the Internet through a commercial Internet Service Provider (ISP) and then use a browser to access resources and information on the World Wide Web." We conclude that allegedly defamatory material about a Florida resident placed on the Web and accessible in Florida constitutes an "electronic communication into Florida" when the material is accessed (or "published") in Florida. In the context of the World Wide Web, given its pervasiveness, an alleged tortfeasor who posts allegedly defamatory material on a website has intentionally made the material almost instantly available everywhere the material is accessible. By posting allegedly defamatory material on the Web about a Florida resident, the poster has directed the communication about a Florida resident to readers worldwide, including potential readers within Florida. When the posting is then accessed by a third party in Florida, the material has been "published" in Florida and the poster has communicated the material "into" Florida, thereby committing the tortious act of defamation within Florida. This interpretation is consistent with the approach taken regarding other forms of communication. Applying this approach, Marshall's posting of allegedly defamatory material about a Florida company that was accessible in Florida constitutes committing a tortious act within Florida, provided that the material was accessed—and thus published—in Florida. Marshall asserts that her acts were completed in the State of Washington and nothing on the website could be published to a Florida computer "unless (and until) the reader reached up into Washington and retrieved it." We reject this argument because it ignores the nature of the Web, which is fundamentally different from a telephone call, an e-mail, or a letter—by posting on her website, Marshall made the material accessible by anyone with Internet access worldwide. Thus, once the allegedly defamatory material is published in Florida, Marshall has committed the tortious act of defamation within Florida for purposes of Florida's long-arm statute. We emphasize that we are only asked to address the first step of the inquiry—whether section 48.193(1)(b) applies to confer personal jurisdiction. The second step is a more restrictive one, precluding suit in any situation where the exercise of jurisdiction over the nonresident defendant would violate due process. This question is not before us in the certified question and we do not deem it necessary to broaden the question in order to address the due process inquiry. The underlying litigation arose from a car accident in Palm Beach County involving AVIC’s insured, John Perkins, a Palm Beach County resident, and Molly Swaby. Swaby died in Palm Beach County as a result of the accident, and her Estate was opened in Palm Beach County. Perkins’s policy was issued for delivery to him in Palm Beach County and provided liability insurance limits of $10,000 per person and $20,000 per accident. Olive Goheagan, as Personal Representative of the Estate of Molly Swaby, filed a negligence action against Perkins in Palm Beach County. The trial resulted in a final judgment against Perkins for $2,792,893.65. Thereafter, Perkins assigned all of his claims against AVIC to the Estate. The insurer was sued in Palm Beach County for bad faith. Thereafter, the insurer moved to dismiss and/or transfer venue to Broward County because the insurer did not maintain an office in Palm Beach County. AVIC filed its motion to dismiss or transfer venue pursuant to section 47.051, Florida Statutes (2008), which provides that “[a]ctions against domestic corporations shall be brought only in the county where such corporation has, or usually keeps, an office for transaction of its customary business, where the cause of action accrued, or where the property in litigation is located.” Here, it is undisputed that AVIC does not have an office in Palm Beach County and there is no property in litigation. Thus, the issue is whether the cause of action accrued in Palm Beach County or Broward County. AVIC’s breach of its contractual obligation occurred when it allegedly failed to exercise its duties of good faith; its duties should have been performed in Palm Beach County. As explained in Ivey, a cause of action accrues where services “were to have been, but were not, performed.” 502 So. 2d at 23 (citing Windsor, 399 So. 2d 65). These duties included making a settlement offer and/or tendering the policy limits to the Estate, which was opened in Palm Beach County; investigating and evaluating the claim, when the accident occurred in Palm Beach County; and advising and warning Perkins, who resided in Palm Beach County, of possible outcomes, risks, and consequences. In West Villages Improvement District v. North Port Rd. & Drainage District (2D09-2221), the Second District granted certiorari and quashed the circuit court's order "which upheld non-ad valorem special assessments imposed by the North Port Road and Drainage District (NPRDD) upon real property owned by West Villages." The Second District stated that the "circuit court departed from the essential requirements of law by failing to apply the principle espoused in Blake v. City of Tampa, 156 So. 97 (Fla. 1934), and therefore, we grant certiorari." MAY A MUNICIPAL DEPENDENT SPECIAL DISTRICT, PURSUANT TO MUNICIPAL HOME RULE POWER, IMPOSE A NON-AD VALOREM SPECIAL ASSESSMENT UPON REAL PROPERTY OWNED BY A STATE GOVERNMENTAL ENTITY, IN THE ABSENCE OF EXPRESS OR NECESSARILY IMPLIED LEGISLATIVE AUTHORITY? Our court has held that a defendant is a prevailing party when the plaintiff voluntarily dismisses an action pursuant to rule 1.420(a)(1) and, therefore, the defendant is entitled to recover attorney's fees under a prevailing party attorney's fee statute. Vidibor v. Adams, 509 So. 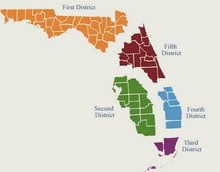 2d 973 (Fla. 5th DCA 1987). Additionally, a prevailing party is entitled to recover an award of costs pursuant to rule 1.420(d) of the Florida Rules of Civil Procedure following a voluntary dismissal.